Family & Pet friendly Luxury Country Estate, with Heated Indoor Pool. Chateau / Country House10333 sq. ft. The newly built country house embedded in National Parkland offers exclusive accommodation with the latest advances in technology, such as intelligent controlled housing, under floor heating, heated pool and Wi-Fi. Surrounded by oaks & carobs, the House offers the peace and quietness that you need to completely disconnect from the outer world.The double height living room offers two different seating areas with chimney and direct access to the large terrace. Enjoy the astonishing views of the Strait of Gibraltar while sip on a glass of wine sitting in the sofas of the cover terrace, even in winter as a second chimney is located here. During nights have barbecues under the moonlight while feeling totally relaxed in the heart of the mountain. Leading from the living room is a staircase that provides access to four double rooms newly furnished and 5 generously sized bathrooms with all facilities. On the ground floor you can have a swim in the heated indoor pool or rest on the sunbeds. Surroundings: Gaucín is one of the famous white villages of Andalusia. The village is perched on the edge of the Sierra de Ronda and its known for its breathtaking views out over the rolling countryside below, all the way to the Rif mountains of Morocco, 120 miles away, across the Gibraltar Straits. Ronda 49 km away, with the oldest Bullring in Spain and its famous gorge is about 1 h drive through enormous cork forests. Jerez, an unforgettable drive through beautiful country side, were the famous Sherry wine is produced,(visits to its wine cellars and wine tastings can be arranged), the internationally known dancing horses show is worth a visit. Beaches of Manilva are 27 km away, Gibraltar and the resorts of the Costa del Sol such as Estepona, and Marbella, for shops. The Atlantic beaches and Tarifa with its famous windsurfing and kitting about 1 h drive and Golf courses from 40 min drive. Morocco with Tanger and its traditional markets is 40 min on boat from Tarifa. Description of The Country House: The Country house with a modern touch provides spacious and comfortable accommodation for up to 14 people and is ideal for groups, families and children, and to hold events. The generously sized and Elegantly decorated Bedrooms have spacious en suite Bathrooms and the new beds are very comfortable. The newly installed Kitchen with access to a separated summer breakfast terrace, has all the appliances of a professional kitchen, Ice Machine, American Fridge, microwave, and extra large oven. The double hight living room with a classic touch, sits 14, the porch-terrace, fully furnished with beautiful outdoor sofas and tables, will allow you to contemplate the panoramic views even in winter, since is equipped with a fireplace. The heated indoor swimming-pool with panoramic views, is situated in a big area that can be used to hold a party, lecture, seminar, or even as a gym. Parking gated, many cars can be parked outside the villa right next door to entrance door, which makes an easy task to bring the luggage in. Places to visit -2: The old monumental cities of Andalucia: Cádiz, Córdoba, Granada, Málaga, Sevilla and Ronda are within a few hours drive and well worth a day trip. My name is Miren, I am from Bilbao. I currently live in between the coast and Gaucin. I love walking, reading, swimming and i'm interested in psychology and oriental philosophy. My husband's dream was to have a house in the Country, and he found his dream spot in Gaucin. We bought the finca in 2003, and build what is today La Posada Romana. We are very proud of the house and the gardens that we have surrounding us. I fell in love of the area when we came to buy the finca, because is so green and there is forest everywhere, is very peaceful and specially we love the views over the strait of Gibraltar. The whole project was drawn in a restaurant napkin and passed on to a wonderful arquitect: Gustavo Kloster, who made our dream reality and managed the building project following to the point our wishes. toilet, Guest toilet in living room area. All bathrooms except one, have windows. Underfloor heating in all bathrooms and in all bedrooms. Hair drier in en-suite bathrooms. All bathrooms are built whit the most exclusive Italian marble. All tabs in bathrooms are the exclusive Montreaux model from Hans Grohe. All the rooms have very efective air conditioning with individual temperature switches. Bed linen and duvets, pillows and extra pillows. theres a washing machine in the washing room. In the washing room there's a tumble drier. Modern, large and well equipped kitchen with all modern appliances. 3 dining areas, 2 outside + one inside. The 2 outside dining areas fit 6 people each. they can be put together to hold 12-14 people. Cleaning is included one time a week. For stays of +10 nights there's a mid stay cleaning included. Less than 10 nights, no mid stay cleaning included. Extra maid service can be arranged, if required at 12€/hour. Play Station Available and various games, Table Tenis, Darts, Books, etc. Walking and hiking: Local guides can take you off the beaten track, across the mountains and into the valleys, for wonderful views you cannot get from the road. We can put you in touch with them to make your own arrangements, depending on your ability. NOTE: Access to the house is a dirt track of 1,5 km. This has recently been repaired and now any car can easily access the house without any problem. Should you be a new or inexperienced driver, I recommend to hire a SUV. Our family of 8 adults had a fantastic week at beautiful Posada Romana. The well equipped house is huge, with dining & seating areas large enough for all of us to gather (with room to spare) and also sufficient space for everyone to find their own quiet peaceful spot if required. The design of the house is stunning and makes the most of the magnificent views, which can be appreciated from many of the rooms & various terraces. The pool and table tennis equipment were a big hit with everyone and used everyday. Communication with Miren was excellent and locating the house not a problem. Miren arranged for us to meet Diego (the Gardener) at the petrol station in Gaucin and he guided us down to the house. Whilst the track was daunting at first, we soon got used to it and made the journey to and from Gaucin several times during the week. We were a family of 8 adults with 8 children, the youngest being 11 months. The villa provided the facilities we required to make a fantastic holiday plus the most breath taking views of the mountains. Miren met us on arrival in the village and took us to the villa via the rather rough track but when we saw the villa it made it all worthwhile. The first impression of the villa is unbelief and when you step inside it is unbelievable. The space is fantastic and the décor is wonderful . Every room had aircon which was welcomed in the 34degree heat. Miren took us to the village and showed us where the supermarket was and also the ATM etc. After she returned home she sent us a list of restaurants to visit plus the best beaches too. her hospitality was second to none. Ester the cook made us two wonderful tasty meals which we thoroughly enjoyed. We recommend her to all holiday makers at the villa. Being a large family the size of the villa meant we were not under each others feet. The pool was on the small side but the children were in it every day and thoroughly enjoyed it. Any problems we had were sorted promptly by Deigo. We would love to return some day.. Thank you Letitia for your review. I look forward to meeting you and your lovely family soon. We stayed here in July and everyone enjoyed this well managed large house. The owner is great at emails. The journey does present some challenge but we left the hassle of the final approach to the taxis. We were delighted not to worry about driving but used Diego, the Handyman/Gardener to ferry us all upto Gaucin when further provisions were needed or to enjoy the many restaurants and bars. Perhaps younger, fitter folk could walk there but its quite a stretch! The location is, in every other way, absolutely perfect. Its private, quiet apart from occasional tinkling of goat bells somewhere and with superb long distant views. It really is enchanting. The house is well managed and generally well equipped with baby and children's gear. The main drawing room/lounge is magnificent and looks at least as beautiful as you see in the pictures. Its the real deal and fabulous. There are 3 terraces for possible eating (& sun-bathing) tho the downstairs terrace (with vined gazebo) is a trek from the kitchen. This is large, modern and right next to the dining room. Good hob, ovens, fridge space etc. Dishwasher floods if you open to pop in a forgotten spoon but effective otherwise. There are 3 possible dining options although the terrace dining is for smaller numbers. Esther, Diego's wife, is available if required to cook for you and we enjoyed her food very much indeed - not easy to please a mix of carnivores, vegetarians and vegans but all were happy! Her food arrived ready to eat and is wholesome, tasty and highly recommended. Sleeping accommodation is on 3 levels and the bedrooms were clean and comfortable. Downstairs they are next to but separate from the pool area which worked well for us with slightly older children (6, 10, 2 x 11 & 13 yrs). Its easily closed off for safety. However, adjacent to the Master bedroom on top level are 3 other double bedrooms (one with bunks, functioning as TV/Wii playroom). There are no bathrooms for these rooms so sleepers have to either use the master bathroom or go down big stairs to the visitors loo-not ideal. The indoor pool is lovely-narrow, long and well maintained. Table tennis, games & a relaxation area is nearby, great for non-sunworshippers. Fab the children didn't need sun cream for the majority of their days here! There's the beginning of a sauna/steam room but incomplete. The garden is lovely & chickens (fresh eggs!) are nearby.. Thank you so much for the lovely review, and for describing the house so well detailed and beautifully. I’m so pleased that you enjoyed everything, from the house to the views and Ester’s cooking. I wish you the best and hope to see you again soon. We stayed at La Romana Posada for almost 2 weeks and loved every minute of it! We were a group of 17 people - adults and kids. The house is magnificent and the views are breathtaking. We couldn't get enough of it! The indoor pool is a treat, especially during colder weather. Just make sure to request to heat it up prior to your arrival. Miren, the property owner, was fantastic from the beginning - helped me get things organized prior to our arrival, answered all my endless questions and once we were at the house, immediately helped with anything we requested/needed. Diego, the house manager on site was fantastic and we fell in love with Ester, who cooked and cleaned for our big group. Such kind and warm people! Ester's cooking is to die for - paella; oxtail; lamb; veal stew. I'm still dreaming of her flan dessert. As for the "off-road" leading to the house - it's absolutely fine. Mostly paved and partly gravel and once you've done it once and know what to expect, not difficult or scary at all. We even drove several times in the dark. Guacin is a cute' quiet little white village to lovely to walk around in. I’m glad you enjoyed the house and Ester’s meals. Our family group of 8 adults and 5 kids (aged 7-13) was easily accommodated in Posada Romana. Both sleeping and relaxing space - inside and out- is plentiful, whether individuals or groups want some space to themselves or to congregate. Unlike some large holiday homes, furnishings are ample and of high quality. The same goes for all the kitchen equipment and supplies: plenty of them for 13 of us. The "tech" was irritatingly unreliable at times, with intermittent wi-fi / internet access and hot water not being available for a day because of network problems. The a/c is similarly affected. The pool / games room is great, but make sure you arrange to get the pool heated to a comfortable temperature. The owner does not hide the fact that you must negotiate a dirt track to get to the house, but it is challenging. We had 6 very experienced drivers and three substantial mpvs/ cars. Still everyone had a certain amount of dread each time we left or came back to the house. We also made sure we never attempted it in the dark, so our evenings were always spent in the house. Just as well that it was so pleasant to be in. Gaucin itself is pretty and very well kept, but much quieter than we expected. We had lunch there one day. The castle is truly a must-see; an amazing and evocative slice of history perched impossibly high among soaring eagles and unbelievable views of the hills and valley. We spent a great day in Ronda, which just has to be seen and a day on the beach in Estepona ( do also walk around the pretty old town). Equally, don't miss Gibraltar: the kids in our party still haven't stopped talking about the Barbary apes and St. Michael's Cave. We would have stayed longer if not wanting to get back before dark. There's a lot to see there. I requested in advance two dinners to be made in the house by Ester, the housekeeper and cook. These were good, plentiful, reasonably priced and completed on time. All agreed that we had a great week and all would return to the area. We all loved the house but none of us will miss that awful track to get there. La Posada Romana sits in 7 acres of land surrounded by mature trees in a National Parkland. The countryside is idyllic for relaxing, walking and riding. 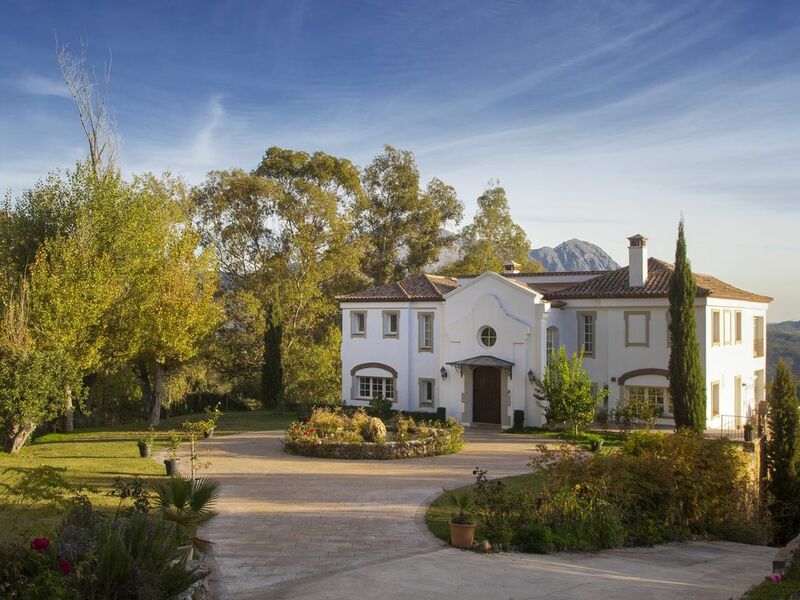 The villa is located 2 km from Gaucín, one the famous White Villages of Andalusia. In this town you may find supermarkets, doctors, banks, post office and many restaurants and tapas bars. Within easy reach are several beaches and local golf courses such as Valderrama. Sotogrande, famous for Polo grounds and night life is only 20 min. away. Marbella with shops, restaurants and night life in Puerto Banús is within a 50 min drive. Tarifa with amazing beaches and world known for kite surfing is only 60 min away, where you could also take a 35 min ferry ride to visit Marroco and the port of Tangier, or take a boat to whale watch. More historical towns can be visited such as Ronda, with the oldest bullring in Spain, Jerez or Sevilla, within an easy car journey. Gibraltar airport at 60 min drive and Malaga Airport only 80. Golf: There are many first class golf courses within easy car drive. Renowned golf courses such as Valderama in Sotogrande, Finca el Cortesin and La Cañada in San Roque are only 35 min away. Ski: In winter, Sierra Nevada, with more than 100 km of snow slopes, lovely bars and restaurants, and easy accessed by car is only 300 km away. For groups of more than 6 persons 70€ per week(10€ per day) per Extra guest. Stays of more than 10 days one middle stay cleaning included. Extra Cleaning 12€/hour available on Request. There's a cook available on request, please contact the owner. There are discounts available for groups of 4 people or less, please ask the owner.The owner accepts well-behaved dogs. Rates are subject to change until reservation has been made. The breakage deposit of 500€, is to be paid at check-in, which will be returned during the week by bank transfer if nothing was broken. There's a fee of 150€/week to pay for the cost of heating the Indoor Swimming Pool. I need a week of notice since it is the time it takes to heat the water up to 26º-28ºC.